Every September, Dragonfly young adult students prepare to embark on an adventure of a lifetime! Each of the respective treatment teams comprised of the therapist, mentors, and the students on their caseload go on separate trips to different locations. This year, three groups set out for Olympic, Yosemite & Yellowstone National Park! Therapist staffed trips are an excellent opportunity for the therapist to see students in action with his/her peers. It provides valuable information to the therapist and real world examples of the struggles and strengths of each individual. 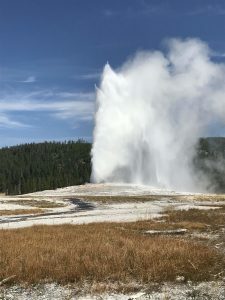 Here is a reflection by Primary Therapist Zoe Bartlett highlighting the caseload trip to Yellowstone National Park. 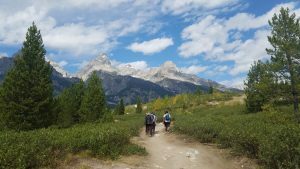 As the great outdoor enthusiast and a founding father of our great National Parks – John Muir – said, “the mountains are calling” and so amorously inclined, we “must go.” Over a duration of 10 days, 14 students, 3 mentors, and 1 therapist took off towards Yellowstone and Grand Teton National Parks. Similar to Muir’s original trek, there work was to be done. Our students worked tirelessly to overcome emotional, social, and mental challenges. The first challenge to work through was idle time in the car, as we began our long journey west. Over the 3-day ride, we stopped at Crystal Crane Hot Springs in Burns, OR where students were able to venture into ponds of up to 101 degrees before spending the night beneath the stars. The following night was spent at Craters of the Moon National Monument in central Idaho and finally we made it to our base camp at Grant Village in Yellowstone National Park. At this point many students were beginning to reminisce about their time in wilderness therapy and how glad they were to now have added bonuses such as full- service bathrooms and snacks from home. The first day leaving camp consisted of a drive down to Jackson, WY to raft the Snake River. Students expressed fear, excitement, and uncertainties as we took off into the bluish-green water. With views of canyons and evergreens all among us, soon students were learning the directives and gliding down the river avoiding obstacles and taking on rapids. Ospreys flew overhead and the water was cold but refreshing. Students also had the opportunity to swim through calm waters or “ride the bull” by attaching to the front of the raft as water splashed over them riding down a rapid. The next day we ventured further into Yellowstone National Park checking off photo-worthy features such as Old Faithful, the Grand Prismatic Spring and the Grand Canyon of Yellowstone. Several students were in the right place to see Bee’s Hive Geyser erupt, a lengthier eruption occurring every 15-18 hours. We stood in awe of the colors of the Grand Prismatic, the 3rd largest hot spring in the world. Throughout the rest of the week, the group hiked, explored, and marveled at various waterfalls, elk, herds of bison, ventured down to the Grand Tetons, kayaked across the lake, and saw bears and wolves at a nature preserve in West Yellowstone. Back at camp, students took turns cooking group meals such as hamburgers, chicken curry, mac and cheese, and even breakfast for dinner. Students practiced working together and each day a person was elected leader to organize and delegate tasks. As the sun would set, students would build a fire and play cards and tell stories until bed. Before long, our trip was coming to an end and we took off back towards Oregon stopping in Boise, ID for the night, before venturing into the last stretch. It was clear at this point that students had made an honest connection with one another on this trip. They expressed gratitude to nature, outdoor adventures, limited access to tech, and the ability to overcome social anxieties and self-doubt. Students returned to campus ready to lean into the new term, having highlighted their therapeutic work and re-energized from the daily hustle and bustles.